How Many Buses Does Toronto Need? Toronto’s budget debate for 2012 brought many issues of transit financing into the open thanks to an ill-considered proposal by Mayor Ford to cut transit operating subsidies by 10%. Recently the TTC put off implementing service cuts originally planned for January 8, 2012, pending a decision by Council on the final version of the budget and the level of TTC subsidy. However, the TTC’s Operating Budget is not the only one that is constrained by City spending policies. On the Capital Budget, the total projected City borrowing required to pay for all of the projects the TTC would like to undertake exceeds a self-imposed target on total City debt. To bring the 10-year debt projection within that target, the TTC restructured its capital plans. Some projects were postponed beyond the 10-year window so that some or all of the spending (and associated debt) did not count, or might be offset by future improvements in subsidy programs from other levels of government. Other projects were modified in scope or cancelled. I discussed the amended Capital Budget in a previous article, but the current debate about Service Standards also has a capital component. Among the cutbacks on the capital side were a purchase of new buses and the provision of storage space to hold these vehicles. An order for 134 new buses (of which 26 were for “contingency” to handle unexpected growth in demand) has been cancelled along with the provision of temporary yard space. Before Transit City was proposed, the TTC had planned to build another bus garage to accommodate its growing fleet. However, Transit City (plus the opening of the Spadina subway extension) would replace some existing bus service with rail, and reduce the total bus fleet requirement. Even with a short-term pre-Transit City bulge, only temporary storage would have been needed. However, now that much of Transit City has been either cancelled or pushed off into the next decade, there will be continued pressure on the bus fleet and on the need for storage space. The Spadina extension will not open until late 2015. The Sheppard subway, if it is actually built, will cover only the portion of the Sheppard East bus services west of Kennedy. Service east to Meadowvale will still be provided by buses. The original opening date for the Sheppard LRT was 2013. Finch West will continue to be served by buses, not an LRT line that originally would have opened in 2013. The proposed extension of the SRT to Malvern was originally planned to open in 2015. In the revised plan, this extension has been dropped. In a briefing note, TTC’s Chief General Manager Gary Webster states that the capital cost of restoring the bus order and storage for the vehicles could be up to $93-million. However, in the TTC’s budget presentation, this number is stated as $73m (see Shortfall Reduction Plan on page 52). If the order is reinstated, the quantity of buses will be smaller by at least the contingency of 26 according to staff comments at the TTC’s last meeting. The challenge in this whole process is to understand just how big the bus fleet should be given the robust state of TTC ridership. For this we must first go back to the bus fleet plan as it existed in 2006. There were two competing views of the future for ridership. In one version, growth would continue at just over 1% per year following a long trend of the past decade. In another version, growth would be more robust at 3% per year. The bus fleet plan had been based on the lower rate, but if the stronger trend prevailed, the TTC would need more buses sooner. A new garage would be needed by 2012/13 even at the low growth rate, possibly by 2010 if the fleet grew faster than expected. Indeed, stronger growth is exactly what arrived. 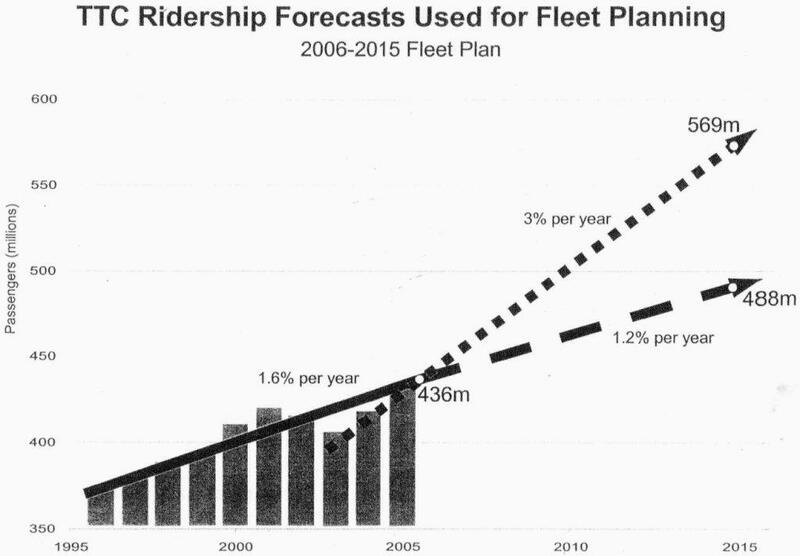 On the original projection, ridership was expected to grow from 436m to 469m between 2006 and 2011. At the higher rate, it would reach 505m. The actual number we now know will be about 499m. The accelerated growth began just after the Ridership Growth Strategy (RGS) rolled out, a policy the current crop at the TTC would undo in the name of “efficiency”. By 2010, the fleet planning had to take into account new factors including the proposed Transit City LRT lines and the Spadina extension. Transit City was expected to displace 168 buses between 2014 and 2019, and a further 30 would be replaced by the Spadina extension in 2016. This led to a plan in which there would be no bus purchases for several years, and the total fleet would actually shrink through attrition back to 2008 levels, well within the capacity of existing garages. By early December 2011, the active bus fleet stands at 1,820 vehicles for a scheduled peak service of 1,520. Requirements for 2012 and beyond will be very different depending on the service quality and ridership we assume in making fleet plans. Service actually operated in 2011 was based on a budgeted ridership of only 487m, not the 499m Toronto actually achieved. This is one reason why there are some routes already over the supposed loading “standards” — there is no budget to operate all of the service the standards would dictate. Conversely, the planned cuts on some routes are impractical and this situation is tacitly admitted by the proposal to retain service on “busy” routes. If the RGS service standards are retained, then the planned peak cutbacks on major bus routes cannot go forward. In the short term, this can be handled with the existing fleet, but more buses will be needed (by the TTC’s projection) in fall 2013. Multi-year projections in the TTC budget (see TTC Final Budget report for 2012 at Page 7) start from a base of 503m in 2012 and rise to 523m by 2015. The base itself is less than 1% above 2011’s projected 499m, and the cumulative growth rate is about 1%. By contrast, ridership is running over 4% above last year, and an ongoing rate of 3% should be easily attained provided that there is sufficient capacity and no economic catastrophe to drive down demand overall. If we take 499m for 2011 and increase at 3% per annum, this would give a cumulative increase of about 12.5% to 2015. In turn, the bus fleet would have to grow from 1820 to 2045. The TTC has not published a detailed fleet plan including such an analysis, but this is as important to the future of Toronto’s transit as the fantasy subway plans. The capital budget does not include any projection of funding needed to sustain strong transit growth, and the operating budget assumes a much lower rate of growth than we actually see. The situation is very much like the one back in 2006. Delaying or cancelling the implementation of Transit City created a crisis in the bus system’s ability to serve growing demand. The Commission’s response is merely to cut service and ignore future problems with meaningless, low-balled projections of ridership, fleet requirements and operating costs. Most of the transit Commissioners don’t want to entertain these debates because to do so counters the received wisdom that transit funding must be cut no matter what. They might even have to admit that the course they advocate — of limiting the growth of service and capacity — is truly a “service cut”, certainly a reduction in the attractiveness and quality, such as it is, of the system, not merely an “efficiency”. This type of “planning” badly serves Council and the citizens of Toronto because we don’t know what the alternatives are and the implications of various future paths. Indeed, we risk hobbling the TTC with reduced service, fleet and staff, and creating a hole out of which a more-enlightened administration must first dig just to undo past errors. In a Briefing Note to the City’s Budget Committee, the TTC advises that it is contemplating the purchase of 150 articulated buses in 2014-16. If Council decides to retain higher service quality in 2012, the need for these buses could be accelerated. Seven routes (not named) would convert to artic operation. The fleet replacement ratio the TTC would use is 1.35:1. The anticipated annual saving would be $60k/bus mainly in the labour cost of drivers. The annualized saving with the 150-bus fleet fully in operation would be $9m. Savings from this scheme have already been built into the multi-year budget projections. This entry was posted in Buses, Finance, Service Cost and Quality, Transit. Bookmark the permalink. some people can only work on one relationship at a time. TTC has multiple routes. and a whole infrastructure that supports the visible vehicles. To make good decisions you need engineering savvy as well as business savvy. lots of math of various kinds. maybe they don’t do this kind of math in council? I note that the $73- to $93-million for reinstating the bus purchase and yard space is in addition to the $65-million or so in Transit City cancellation costs. There has been quite a bit of media attention to the latter number, but I don’t think I have seen any mention of the former (outside of this blog). As of 2008 the approx cost of a diesel bus was $500k plus the garage (Mt Dennis cost $92M in 2007). So disregarding inflation that’d be $65M + $113M + 92M for a total of $270M. Did New Flyer sell the used OC Transpo artics yet? Steve: Do we really want hand-me-down buses in Toronto, especially considering their track record in Ottawa? 150 articulated buses will also require specialized maintenance facilities such as hoists which will either make for some renovations to existing garages or building a new garage specifically to house these buses, which will increase the total capital expenditure for this fleet. As for temporary storage, articulated buses will certainly need to be housed in a permanent facility, with standard buses being pushed out to a temporary garage (which will incur additional costs) in addition to those already being paid for carrying semi-dormant facilities like Danforth and Davenport garages, which also require capital investment to be usable again. Steve: Portable hoists tend to be used these days rather than fixed ones, and so the real issue is whether the longer buses can move around easily within whatever garage(s) they are assigned to. Davenport is far too small, and even Danforth would not be ideal. Both of these sites now contain other TTC departments that would have to be relocated if they were returned to use as bus garages. Could we bring back the recently retired Fish Bowls to solve the bus shortage? Their interiors seemed so roomy compared to the low-floor buses. But I thought the cuts to off-peak service was so that service could be improved on busy routes which needed those buses. How found Honest Rob break a promise? Steve: Yes, some busy routes did get more service, but about 1/4 of those improvements were to be rolled back in January thanks to the lower service standards. I am sure that if they get away with the January cuts, we will be right back to the same sort of games in a year’s time or less — robbing the light routes in order to afford enough service on the busy ones. Scarborough will be a ‘fun’ place to travel through in 2015. The RT will be shut down because it has reached the end of its life and the TTC will be facing a severe bus shortage. Where exactly will the buses come from the replace the Scarborough RT service? Didn’t the TTC remove articulated buses from service about 10 years ago because they would always get stuck in the snow in winter? Steve: The artics the TTC bought were inferior vehicles, and that experience is a big reason we have not seen artics in Toronto for years. Now the industry seems to have caught up with TTC requirements. Are the artics seen as replacing the current buses at the 1.35:1 ratio, meaning fewer vehicles/drivers but the same number of seats (standee spaces)? Steve: Actually, we should wind up with slightly more capacity as the artics are 1.5 times the size of a regular bus. However, this capacity may not all be useable unless the TTC moves to all-door loading (like streetcars) on the routes using these vehicles. Steve: A rebuild is a capital expense. One debate within the TTC has been whether the practice of keeping vehicles on the road far longer than other cities through major rebuilds is cost effective. A lot depends on the quality of the underlying vehicle and the annualized cost of buying new vehicles more often versus rebuilding old ones. The debate is further complicated by the various sources of funding which may skew a decision based on what is considered “eligible”. Speaking of Transit City displacing buses, the TTC chose a 400-600 metre stop spacing for the Finch LRT, in order to avoid the need for an infrequent parallel bus service (which would be needed for larger stop spacing lines). Yet, chapter 4.3.1 of the Finch LRT EA then states than the 36B and 36D would be maintained after LRT construction. Chapter 4 of the EA is available here. First of all, I’m assuming that they meant that the 36B and 36D services would still exist, though as reduced service; otherwise, the parallel bus service would have frequencies ranging from every 3-10 minutes! Secondly, maintaining some buses on Finch West seems like a waste, since the LRT was already designed specifically to accommodate local travel with its proposed stop spacing. I’m confused as to what the final result would have looked like on Finch. LRT only? LRT + infrequent buses? Steve: Considering that everywhere else the TTC has replaced bus with rail, they have fought bitterly against keeping a parallel bus service (or done so only on very poor headways), it’s hard to believe these branches route remain in their entirety. I think what they mean to say is that a bus would provide service on the 36D Milvan/Toryork loop, and on the outer end of the line beyond Humber College, not that there would be a fully parallel bus service all the way along the LRT line. a) Anyone manufactures a 45 foot transit bus? b) Would this increase the weight of the bus to the point it would need a third axle? I realize that there are probably some city routes that could not handle a 45 foot bus but there a lot of heavy routes that are basically a straight line with loops at the end. These could handle them. The old GM “New Look” buses had a 30 foot wheelbase between the axles. If I remember correctly, the new buses have only a 20 foot wheel base in order to get a wider front door. To do this they had to move the front wheels back and move the rear axle forward to maintain the load distribution between the axles. This results in a 1/3 reduction in useful space between the wheel wells. Most of the extra five feet could go between the axles and provide more useful seating and standing room. Most of the articulated buses that I have seen in the US have only two doors, the normal front door and one behind the articulation. I am not sure why they do this but I suspect they are are on long haul routes where in the inner end is the major destination/origin for most of the trips. Robert: North American Bus industries sells a 45 foot bus called the compo bus. New Flyer sold a 45-foot bus for awhile, called the Invero. It composes much of OC Transpo’s non-articulated fleet. From the look of the interior, much of the added space was actually in the raised section, accomodating more seats in the back. If such a vehicle existed still, would it fit in the sawtooth bus bays that have been built at major terminals like Eglinton Station? (the same applies to articulated buses as well.) Also, the TTC would really need to step up their fleet management, because if the added capacity is written into (taken back via service reductions?) the schedules, then running 40′ buses on a 45′ route would cause a 15% shortage in planned capacity. Steve: Longer buses generally will be a problem in facilities designed for 40-foot vehicles. As for using the “wrong” size bus, the TTC has never managed to get its schedules and fleet assignments lined up with each other. Ever since we got artic streetcars, we wound up with 4-axle cars trying to do the work of a 6-axle vehicle but also at a headway appropriate only for the larger cars. This has been a problem on Queen, and to a lesser extent Bathurst, for a long time. Thanks Justin for the information. I googled NABI and found a CalTrans study about the buses. I also discovered that they started out as IKARUS, the company that made TTC’s first articulated buses. Despite that I read on. Link to the CalTrans study. The life expectancy is 18 years and the annualized costs are less than a standard 40 footer according to CalTrans. It is an interesting option. Steve: Be careful with that cost comparison. They are assuming a shorter vehicle life (12 years) for the comparison vehicle which negates the capital cost advantage of the “standard” 40-foot bus. Looked at another way, they are paying a premium of over $200k/bus for six seats and hope to make this back in lower maintenance costs and a longer lifespan. Moaz: How bad would it be for the TTC to buy used buses from other jurisdictions? It seems to me that the 905 services keep their buses for 10 years (give or take) and at the end of their working life they probably still have some years left. I recall that the problem in Ottawa was with the early New Flyer D60LF artic buses which were rusting out. Then there was the problem of pusher artic buses in Ottawa snow. But the MT / MiWay artic buses purchased after 2001 seem to be much more reliable in the snow and lasting much longer. True but many US cities write their buses off after 8 years. It will be interesting to see how the carbon fibre buses hold up over the 12 and 18 year span. The sealed bottom construction looks interesting. It is a construction method that is worth looking into. Steve: I’m not disputing the comparative lifespans of buses, merely pointing out what Caltrans used in their assumptions versus actual experience here in Toronto. It does not matter that the US systems treat buses as throwaway objects, largely because the subsidy policy encourages this sort of approach. If we are talking about new buses for Toronto, then it is the Toronto experience that must be used as a base of comparison. Highway buses are longer, because they tend to only be used on fairly straight highways and major streets. Some TTC buses go on less major streets, and turning from a single lane road to a single lane road, is tough with a 40′ bus. When the Finch sinkhole a couple of years ago, closed Finch Avenue, it meant going South on Wilmington a right on Overbrook and then another right onto Dufferin, that turn from Wilmington to Overbrook is from a road that is about a lane and a half onto a one lane road, and a 40′ bus barely made it. Would be a no-go for a 45′ bus. It was a poor design on the TTC’s part, that had 4 across seating on the upper deck of the Orion 7’s, because it meant almost no standing room up there, run two side seats and you would probably gain as many spaces as you would a 45′ bus. Steve, I would just like to state that I am from Ottawa and I actually work in the Maintenance department at OC Transpo. Those articulated buses that we got rid of, were actually way more reliable then their replacements. In fact just prior to their replacement, we finally figured out the tricks to keep them from breaking down. In fact if you would care to come to Ottawa and ask any mechanic who works for OC about those old articulated buses, they share the same opinion. The City also falsified most of the information in that report that was presented to City Council, making these buses look like “utter junk” when reality is, they aren’t. Also for the record, there is still 214 articulated buses still for sale. However Ottawa might be buying some back because our new buses are that junky. We’ll find out in January. Steve: And the problem then will be, if they truly are not junk, to get the TTC to buy them as “good vehicles” when there’s so much on the record saying the opposite. I noticed that there was a question here about using 45 foot buses. 40 foot buses are standard under the HTA (12M length). Under Part VII Sections 109 and 110, vehicles over 12.5M in length require special permits (bike rack equipped buses fall under this regulation as the racks cause the bus to exceed 12.5M in length – every TTC bus I have driven that is equipped with a bike rack has a copy of the special exemption paperwork included with the “paperwork” required to be on the bus (a copy of this exemption is required for each municipality that the bus could operate in – TTC buses have the paperwork for Toronto, York Region, and Mississauga)). For those who are interested, here is the link. The HTA also specifies that artics do NOT fall under this regulation. Jonathon says: New Flyer sold a 45-foot bus for awhile, called the Invero. Invero was only available in 40′ version. The only 45′ bus New Flyer built was D45S “Viking” (45′ high floor suburban coach). These buses were only sold to Houston (101) and New York (3). Los Angeles is going for a fleet that is contained entirely of 45′ and 60′ buses for local service (the Orange Line BRT is on track for 65′ buses). Because of the higher axle weight, there have been reports that the 45′ buses have been damaging the roads. Also, the bigger turning radius for the 45′ buses means that they couldn’t be operated on routes that had significant residential street operation. On the plus side, since I believe NABI has no Canadian operations if the TTC bought enough they’d likely have to build a plant in Ontario to satisfy Canadian content requirements. Such a plant would be good for the local economy, and could prod other agencies to buy the buses as well. New Engines called “Cummings ISL” which are used in the majority of brand new buses, and powers nearly every bus purchased in Ottawa ever since 2004 (including these new D60LFR articulated buses we got) have a tendency to “blow up” after 200,000 kms. The Detroit Diesel Series 50 found in our old articulated buses never had that problem, unless you forgot to change the oil every 5,000 kms (which you should be doing anyway, it’s just that is how our maintenance standards used to be in Ottawa as all the previous engines never gave us that problem, which is why back in 2001, we had engines blowing like crazy and we quickly learned). Also any brand new bus is EPA 2010 compliant, we have had many problems with this as a new feature with EPA 2010 is something called a “Regen” which requires a mechanic to sit outside the garage for an hour idling the bus (as there is a chance of the bus or exhaust pipe catching fire), while it cleans out all the particles from the particle filter. We’ve had many problems with this as some buses come back the next day for another regen. Heck, once we did a regen and as soon as we drove it out of the garage for a test drive, the regen light came on again, and it was the third regen that was done to it that day. This has been very time consuming and because of it, we are lacking time to provide preventative maintenance. This can be shown in how the rest of our fleet is now appearing to fall apart, and the D60LFRs are directly to blame. Also the reason why you never hear how unreliable our new buses are is because of the fact that would not look good considering all that was previously said by the City about how bad our old articulated buses were. But mind you most people who voted in favor of this deal on City Council, are no longer part of City Council. But as for finding out the record, since City Council won’t make this public, if the Commission really fishes around enough at OC Transpo, they would find out the true story. At least someone can benefit from our mistake. As for the “45 foot Invero”, it is not 45 feet long, it is actually 40 feet long (41 feet if you include the bumpers in there). We should know considering we have the largest fleet of those. If anything they should of replaced all 326 of them instead of replacing a fleet of buses that aren’t giving us nearly as many troubles as the Invero’s have been giving us. Sad thing is that our Invero’s will be our oldest bus as of next year (or soon to be this year) when the 75 Double Deckers arrive. Mike and Steve, I agree with you with the maintenance scenario with the NFI artics. IMO, the TTC will make major maintenance and refurbishment of the D60LF vehicles. Let’s say the look of the bus and seating could be identical to the 1999 D40LFs appearance. For NovaBUS, TTC could operate a fleet of LFS, LFS Artics, D60LFs, and D40LFs along with most Orion Vs. Why not get a younger Orion VIs who are like 12 years old? Over the S50 issue, there are multiple Orion VIIs built before 2005 have problems (par with the unsuccessful hybrids). The Cummins ISL VIIs are a maintenance with mechanics doing the job with the buses. The older VIIs have issues and there are a fleet of 289 buses at Eglinton Garage with Birchmount 193 units causing the ruckus in cold climates. The S50EGRs could’ve been replaced easily with the seating arrangement. Or let the lift equipped buses get a reprieve for another four years. Hey, I rode multiple types of Orion VIIs over the course of my life and has little or no problems. The Orion IIs are out of shape and retirement is overdue, let’s get the EZ Rider II BRTs to replace them. Upon T.T.C. staff’s contemplating the purchase of new vehicles, be those articulated buses, once again, or any other kind, detailed attention needs to be paid to issues of performance and reliability not only on grounds of mechanical worthiness, but also on grounds of customer satisfaction such as with respect to ease-of-use and safety-of-use. Better attention to detail, that way, than was exemplified in the following way with respect to acquisition of the Ikarus artics. My major problem with the Ikarus artics, from the standpoint of a rider, was with the need to step up into a seat, then step down out of a seat, because the seating areas were on platforms raised above aisle-level. Not only did that make access to, and egress from, the seats awkward and, in my opinion, unsafe, it rendered uncomfortably narrow the bus’ effective width-of-aisle. Standing passengers needed to occupy aisle space more than otherwise they might have, because placing one’s feet partially beneath the seats was not possible to do. Also, and for the same reason, one had to uncomfortably lean forward, somewhat, in order to gain access to any high-level handholds, so causing one not to be as well balanced against the disturbing effects of high-speed lane-changing and so forth, as otherwise one might have been able to be, and which, as far as bus travel is concerned, although it may always have to be a sore point that riders must contend with, it should by design be minimised as much as possible. I was recently in Montreal and saw the Nova articulated buses in service there. (They were on a route by my hotel in very frequent weekend service despite carrying next to no passengers.) I can’t speak to their reliability, but anywhere I’ve ridden Nova’s recently they’ve been a smooth and pleasant ride with a unique look which isn’t ugly. One unusual and practical feature I noted was the 1/3-2/3 split in the front door. This made it much easier for the driver to get in and out of an out-of-service vehicle by only moving the larger leaf of the door. It would be interesting if this could be used as an in-service mode to reduce the climate effects from the door opening at stops if the customer demand was not excessive. Perhaps someone more familiar with Montreal and Nova can speak to this. I would have to think Nova has sorted out their transmission problems since demonstrator #1000 was roaming around Toronto. Montreal’s hills would demand that. Are there any downsides I should know about with present-day Nova?